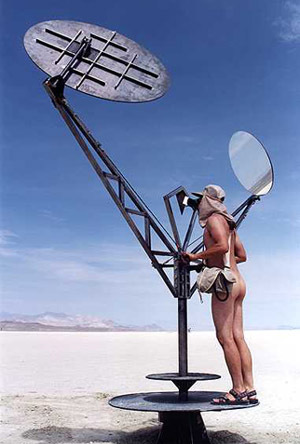 Cassidy Curtis and Chris Whitney, The Telestereoscope, glass and steel, 3.5 meters high, 2000. 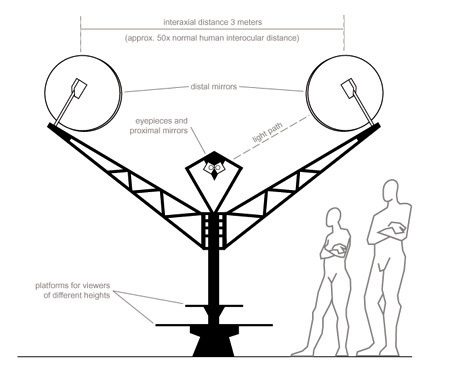 Scale drawing of The Telestereoscope, 2000. The Telestereoscope is an optical device that alters one's perception of the world by increasing the distance between one's eyes. This has a subtle, but often profound, effect on the sense of depth, size and distance. People have a wide range of reactions to the experience. Some say it makes the world seem miniaturized: cars become toys, and landscapes look like model train sets. For others, the environment deepens and splits into many distinct planes. One viewer described it as "like looking at the real world through a Viewmaster." What causes this range of perceptual effects is a conflict between incoming information and deeply wired visual expectations. The device greatly exaggerates interocular disparity while leaving most other cues intact. One's visual system is forced to resolve this dissonance when calculating depth, size and distance. The results vary from person to person. The piece was inspired by the overwhelming scale of the Black Rock Desert, which I experienced for the first time at Burning Man 1999. The other inspiration was a stereo photograph I once saw of the Grand Canyon, shot with two cameras 10 ft apart. In the photo, the canyon looked much smaller, like a very detailed movie set. I realized that if one's eyes were really that far apart, the desert would seem to shrink down to a much more comprehensible size. I envisioned a device that would use mirrors to create this effect. Chris Whitney, an expert at metal fabrication, enthusiastically joined me in the design process and made it possible to actually build such a device. To function at Burning Man, our device had to be sturdy enough to withstand heat, cold, rain, wind and the playful hands of thousands of participants. It had to spin in all directions, have an unobstructed view, but be within reach of viewers short and tall. This combination of engineering constraints gave rise to a familiar form: a stick-man with upraised arms, not unlike the Burning Man effigy. We added a few flourishes to enhance this resemblance. We came to think of the device as a way to see through the eyes of the Man himself. In the desert, the Telestereoscope took on its true nature as an interactive toy. People climbed onto it and spun around as fast as they could. The other participants, with their elaborate costumes, vehicles, and sculptures, all became a part of the surreal three-dimensional show. And the ever-changing environment of dust storms, thunderclouds, sunsets and lasers brought many people back for return visits. There were some surprises even for us: on one hot afternoon, I found I could see shimmering heat mirages leap out from the horizon in sharp relief, a visual treat I never would have dreamt possible. On a personal note, the Telestereoscope was the quintessential Burning Man experience for us. We conceived it as a gift to the community and as a challenge to ourselves. The result was the most rewarding artistic collaboration imaginable.